Youths living at a Buddhist temple in Bangkok wrestle with the basics—cheap food, among them—in these coming-of-age stories. 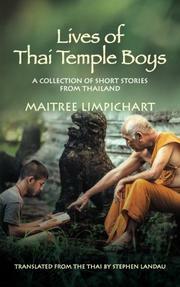 In 15 autobiographical tales, Limpichart (A Man in Saffron Robes, 2013) writes of teenagers, most of them students at Bangkok colleges, who get free lodging at an unnamed temple in exchange for doing chores and maintenance work for the monks. For the temple boys, most of them from impoverished rural families who send them skimpy and irregular stipends to live on, it’s a life of austerity and persistent hustling to make ends meet. Several stories follow the travails of boys trying to get food to supplement the meager temple fare of rice with fish sauce; their various stratagems include begging, borrowing, and selling blood. Residents must guard their clothing from thieves and often pawn their meager possessions to eke out the days until the next money order arrives from home. The daily struggle for survival is a persistent, though gentle, picaresque adventure that most of the boys weather with a little help from their friends. Meanwhile, Limpichart’s alter ego/narrator engages with problems of moral responsibility, ponders his prospects—a post in the government bureaucracy is the holy grail for these students—and takes in a cast of colorful acquaintances, including a hard-luck aspiring boxer who is hopeless in the ring, a gay roommate who makes a pass at him, and a sly con man who scams food by crashing funerals and weddings. In Landau’s workmanlike translation, these winsome narratives unfold as loose-limbed, shaggy dog stories that often close with an ironic punch line and an Aesopian moral. (“A birthday is an occasion for acquiring merit by offering food to monks, not for snatching meals away from them.”) The content and conflicts are fairly tame—the stories are often used in lessons in Thai schools—but together they paint a rich profile of life and longings among young strivers. At their best, as in a tale in which the narrator returns to his hometown when his father dies, Limpichart achieves a quiet but moving emotional power. Evocative profiles of Thai young adults growing up in hard circumstances but with a hopeful future.